Sometimes, it helps to understand things from a totally different perspective. Star Trek’s Ferengi are a species whose culture is entirely based on commerce. To a Ferengi, business is pleasure and money is everything. So how would a Ferengi invest in Earth’s stock market? What would their Blue Planet Portfolio look like? Froogis, our Ferengi, wants a diversified all-Earth equity portfolio. Seeking local wisdom, he’s advised, “Hey Froogie, why not buy an All Country World Index (abbr: ACWI)? It owns Earth’s most liquid stocks weighted by market capitalization.” Ferengi prefer buying by atomic mass, which is like buying by the pound rather than the cup. This hypothetical scenario describes how equity portfolios are often designed. The US stock market represents about 50%-55% of the typical ACWI1. Understandably, investors exhibit a home-bias, preferring to invest disproportionately in their home-country’s securities. Many US investors in particular are simply not comfortable investing half their equity abroad. Then there’s the issue of performance, both absolute and risk-adjusted. International (non-USA) has underperformed over the past twenty years, and consistently so over the past ten years. 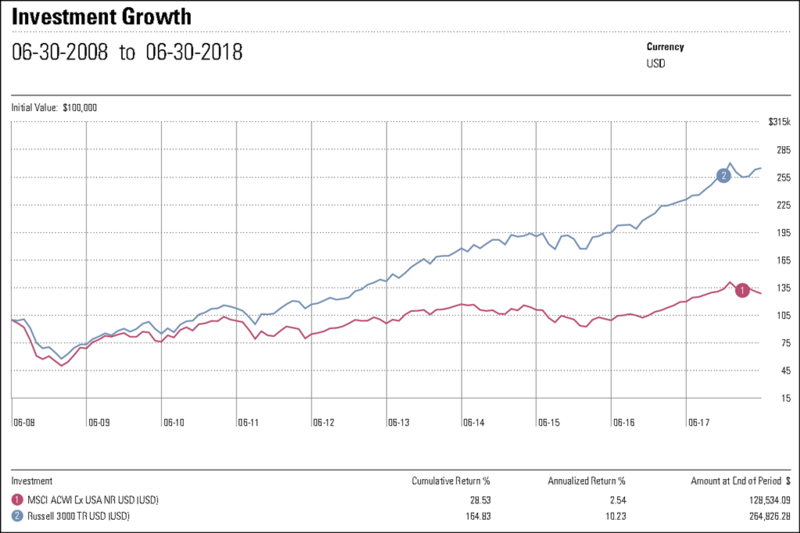 According to Morningstar, the MSCI ACWI ex-USA has underperformed the Russell 3000 Index (all-USA) in the past 10-years by half with 22% more volatility. What happens when you combine them? A portfolio weighted evenly between all-USA and ex-USA returned about 6.42% annualized over the past 10-years. Drop international to 25% and two things happen: performance increases to 8.33%, and volatility decreases. 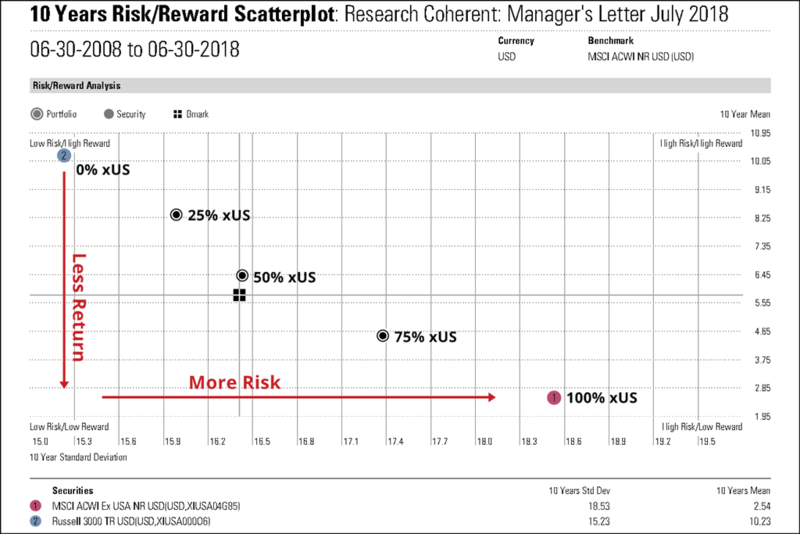 For $100,000 invested, that’s an additional $36,272 with less risk. Over this same period, some advisors have been increasing their international equity exposure to 30% or more2. At Coherent, we continue to benchmark our equity portfolios to 25% international. And in recent months, our portfolios have owned less. For now, we feel this provides our clients enough diversification without unduly sacrificing risk-adjusted return. Diversification isn’t always a good reason for underperformance. Just ask any Ferengi. According to their fact sheets dated March 31, 2018, The iShares MSCI ACWI ETF (ACWI) was allocated 52.0% to USA. The Vanguard Total World Stock ETF (VT) was allocated 51.7%. Equity mutual fund assets averaged under 20% international in 2000, see “Are investors truly embracing international diversification?” by Vanguard Research, October 2010. Vanguard increased its ex-USA allocation to 40% from 30% in 2015. According to their fact sheets dated May 31, 2018, Vanguard Target Retirement 2060 Fund (VTTSX) allocated 40% of its equity to international while Schwab Target 2060 Index Fund (SWYNX) allocated 35%.